An episode guide for those of you who have missed episodes or just need reminding of old ones. At the moment these are somewhat detailed summaries, but I suggest you go to Beyond Evolution if you want to read what happened in each episode in great detail. Currently, I have most of the season two guides done but there are a number from season one left empty at the moment except for a very brief line or two summary. Thank you for the screen snaps Haruka! Strategy X - starring Cyclops, Jean, Professor X, Toad, Mystique and Nightcrawler. Whilst at a Bayville High football game Scott notices Toad picking pockets and goes to stop him, just as three football players are about to start punching him for stealing etc. Scott loses control of his powers and causes the explosion of a nearby gas cylinder thing but Xavier adjusts all spectators thoughts so they won't remember the event before picking up Nightcrawler from the train station. Once at the Institute Kurt is shown his room, uniform, image inducer and is introduced to the Institute's current students Jean and Scott. Meanwhile, back at the school Principal Darkholme (Mystique) calls Todd to her office and asks him to find out about Scott and the X-Men, so he talks to Scott about them both being "different" and so, Scott tells Toad to come to the Institute and phones Xavier to tell of the news. Storm is sent by the professor to audition Toad when he does show up at the Institute, causing him to jump through the mansion window and collide with Kurt. The two fight, ending in an invitation for Toad to join the Institute (which he declines) and Nightcrawler and himself ending up in the Danger Room courtesy of Kurt's power. The room is shut down before any physical damage can be done but Toad runs away, bumping into Logan on the way and Kurt also runs off as he is upset about causing the accident. Scott comforts Kurt and Wolverine is welcomed back to the Institute. However, Mystique is angry at Toad and shouts at him, only to be told by Magneto that she shouldn't be so hard on him as "this is only the beginning." The X-Impulse - starring Shadowcat and Avalanche. Kitty is dreaming of flying, when she falls and wakes up to find herself in her basement instead of her bed and her pillows and sheets half phased through the ceiling. Xavier picks up her mutant signature on Cerebro due to this use of power and he and Jean go to Northbrook to try and recruit Kitty. When they arrive, Kitty's dad is unimpressed and tells them to leave them alone so Xavier sends Jean to see Kitty at school. At school, Kitty accidentally phases out of some lockers and bumps into Lance who is excited about her power and shows her his, she runs off but later Lance realises that he could use her to break into the school office and steal test answers. However, before he can approach her again Jean meets Kitty and tries to help her, explains about her own powers and that she can read thoughts. Kitty runs off again and into Avalanche who tells her he can help her control his powers and convinces her to phase into the office but when she refuses to go with Lance after Jean and Kitty's parents show p he gets angry and causes the ceiling to fall on them all. Jean uses her powers to protect everyone and Kitty them phases them all free of the building and Kitty's dad finally considers her joining the Institute. Meanwhile, Lance bumps into Mystique who tells him to come to Bayville with her and gives him his code name. Rogue Recruit - starring Rogue and Mystique. Rogue is asked to dance by a boy named Cody at a party somewhere but accidentally touches him in the process. She becomes confused and leaves the party using Cody's football moves and then goes to his house thinking she is him. Meanwhile, Mystique and Destiny, who had been looking after Rogue, are talking about recruiting Rogue for the Brotherhood. Mystique decides to morph into different X-Men to scare her and does this with a number of them, causing Rogue to run every time she sees one of the real X-Men who are trying to recruit her. Anyway, she ends up absorbing Kurt and Storm in her efforts to escape and ends up joining Mystique because of her trickery. However, Jean did manage to give Rogue a communicator thing that she is holding t the end of the episode. Mutant Crush - starring the Blob, Jean and Rogue. Mystique offers the Blob, who appears in a show as a strong man, a place at Bayville and he accepts. However, everyone at the school makes fun of him, with Jean the only one who shows him any sympathy and compassion and who gives him help finding his way to class. Because of this, Fred asks Jean out and when she refuses, he kidnaps her and takes her to a building somewhere surrounded by scaffolding. Wolverine finds Jean after she calls Xavier for help telepathically but is knocked out by Blob, the same fate befalls Scott. Jean retaliates by throwing a filing cabinet at Fred but this only makes him angry and just as he is about to crush Jean with some machinery, Rogue turns up, absorbs Scott's powers and attacks Blob. When he tries to hit her, she absorbs him too and uses his strength to hit him high into the air and away from Jean. Even though the team agree that they owe Rogue, she doesn't want to become part of the team just yet and runs off. Speed and Spyke - starring Quicksilver and Spyke. At at high school basketball game it becomes apparent that both Strom's nephew Evan (who she has gone to watch) and other student Pietro are mutants. The two boys are biter rivals and argue over who is the better player until Ororo comes in to talk to Evan about his powers and tries to convince him to join the Institute. Jean and Scott arrive to help convince Evan but he is rude and takes of back to school where he finds that Pietro has trashed the lockers, leaving Evan to take the blame. 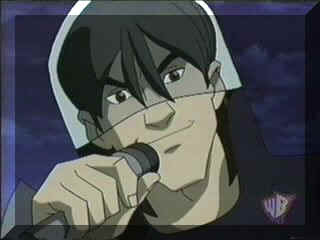 So, Spyke ends up behind bars but is released by Xavier's 'influence' causing Evan to finally agree to join the X-Men. Quickie and Evan have another confrontation the next day with Pietro causing havoc until he is taken down by Scott, Jean and Evan and put in prison. However, Magneto turns up and gets Quicksilver out of jail so that he can join the Brotherhood . . .
Middleverse - starring Nightcrawler and Forge. Scott and Kurt argue at school about whether or not to go to Duncan's party and eventually Kurt ports away after Scott pulls his tail! 'Crawler lands in the basement of the school and breaks his image inducer in the process and then finds a lab, in there her trips an alarm and self-destructs the lab. Rogue, who heard him port in goes to see if he's okay and ends up finding something from the lab that wasn't destroyed, Kurt tries to take it from her but this results in her accidentally zapping him with it and so, he gets trapped in ';Middleverse'. Rogue dumps the zappy thing but Toad finds it a starts to zap all furniture and even Mystique's car into Middleverse, as Nightcrawler teleports out of the way of the falling car in Middleverse, Scot and Jean see a ghost-like image of him doing so for a split second so they know what's happened to him. Meanwhile, Kurt meets Forge and he explains that he created this 'pocket dimension' and got trapped ion it in the '70s and then creates a gadget so that Kurt can go back to the real world for a minute or two to tell the others how to save them. The X-People find the lab and the zapping thing and work put that there is a pocket dimension: Scott wants to destroy the machine but if he does, Kurt and Forge will be trapped in Middleverse forever. So, this is the time for Kurt to port back and tell them what to do but he only manages to say "Reset. Don't . . " before he disappears again and thankfully the message gets across, the machine is reset. However, the two aren't home-free yet because they need more power to get Kurt to port them back and so, they us Raven's car but smash the zappy thing in the process of getting out of Middleverse. Turn of the Rogue - starring Cyclops, Rogue and Mystique. In a battle simulation, Rogue is the enemy and she finds out about this later, thanks to Mystique, juts before taking Jean's place on a school trip. On the ride to the mountains, the bus begins to skid out of control on the snow and Rogue watches Cyke save it from crashing using his optic blasts. Rogue suggests that they take the snowmobiles to their location and almost runs Scott of the cliff in the race they have that follows. During the lecture in the cave, Rogue wanders off and is followed by Scott who tells her he wants to be friends and that she's been lied to. Just then, Paul walks up to the two and morphs into Principal Darkholme and then Mystique, shocking Scott who had no idea of his principal's true identity. Raven shoves him of the ledge and Rogue is too late to save him so she grabs Mystique with her bare hand to find out the truth and sees flashbacks of all the lies that Mystsy fed her in 'Rogue Recruit' and of her morphing into the X-Men. Spykecam - starring Spyke, Wolverine, Sabretooth, Shadowcat and Rogue. Evan gets an assignment to film something about family life and ends up getting knocked off his skateboard by Sabretooth so he can watch the tape and find out where the Institute is. The next day, Wolvie finds footage on the tape that Sabes put on there the day before just as the man or should I say animal? !, himself rips open the gates of the Institute. The team manages to get rid of him but Xavier is worried that he'll try and kidnap a student and so, everyone is forced to stay inside. Spyke wants to make up for his mistake and asks Kitty and Rogue to help him with his plan. They leave the school and are followed by Sabes as they go to the woods to be taped for Evan's assignment. Creed attacks and manages to knock the three of them out one by one but luckily it's Wolverine to the rescue(!) and he holds Victor off whilst Rogue recovers and touches him: knocking him out, but growing fangs and long hair! Anyway, so they defeated Sabretooth (Yay!) and drop him off far away somewhere in the snow, may be Antarctica or something, and then we see Spyke's film about his X-Men family and Rogue and Kitty both dancing for the school play they were practicing for throughout the episode. Survival of the Fittest - starring both teams of mutants and Juggernaut. The Juggernaut is released from his holding by Mystique and sets out to find Xavier, whilst the younger mutants are competing at camp . . .
Shadowed Past - starring Nightcrawler, Rogue and Mystique. 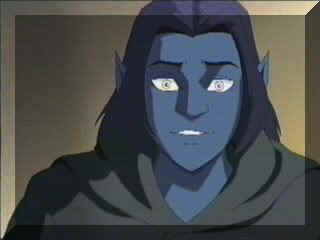 Nightcrawler finds out that Mystique is his real mother . . . Grim Reminder - starring Wolverine, Shadowcat, Nightcrawler and Sabretooth. Wolverine goes to Canada to find out about his past with Kitty and Kurt are also taken along for the ride . . . The Cauldron (parts one and two) - starring Magneto, Cyclops, Havok and . . . well, pretty much everyone is important! . .
Magneto attempts to set up a place called Asteroid M containing all the strongest mutants with a machine that will mutate and make them stronger than ever . . Growing Pains - starring most of the mutants from season one and the New Recruits. The premiere of the second season begins with a football (or soccer to some of you ;) ) match semi-final being won with the help of Jean. The new principal, who is called Edward Kelly, asks all the school to go to the final and show their support. Rogue meets a new girl called Risty and Lance tries to impress Kitty but ends up getting into a confrontational situation with Scott after school, Scott can't do anything though because he can't reveal his powers. 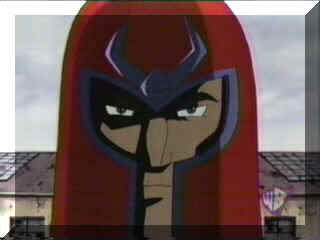 Cyke knows that he shouldn't reveal himself, because earlier in this episode, after becoming mighty jealous over Jean and Duncan, Kurt, Kitty and him use their powers in public to save a bus of children and the professor tells them that humanity is not ready to deal with mutants yet and so, they should stay hidden. Anyway! So, at the match all is going well until Lance decides that the Brotherhood should show the school that they are mutants and proceed to cause damage to the buildings and reveal that all the kids at the Institute are mutants too. A big battle between the Brotherhood and X-men ensues, in which the school gym catches fire, Lance saves Kitty from being crushed and Rogue absorbs Blob (among other things), until Storm arrives and causes it to rain. All the teachers and pupils at the school are disgusted by the mutants and turn away from them, so the professor decides to wipe their minds of the event and convince them other events happened. However, the professor blacks out when he is trying to change Principal Kelly's memories and is not sure if he finished the job. Logan also gives the revelation that the television company filming the footie match didn't broadcast because of a 'Magnetic Disturbance'. Ooooo! Jean's powers begin to go out of control, at first she simply involuntarily hears others thoughts but thinks she can handle it. However gradually her other powers become uncontrollable also with accidentally throwing javelins and shot puts etc. around the school field until she faints. Scott takes her back to the Institute where she is laid on a table and objects begin to rise into the air and spin around her, bending and twisting, she lets off a couple of psychic blasts which make the rest of the team come running. The professor says that Jean's powers are evolving too rapidly for her to control and so, Rogue offers to drain off some of the confusion in her head. Xavier agrees as there is no other choice and Rogue is teleported to Jean by Kurt and touches her face. Now that she has more organised thoughts, Scott attempts to make Jean focus on him and therefore, bring her back out of her mind. Scott succeeds and so, Jean is saved. Badda Bing Badda Boom - starring Boom Boom and Nightcrawler. Boom Boom doesn't take a training session seriously and nearly kills Kurt by accident. This means that both her and Kurt are grounded and so, cannot attend the Bayville High Carnival which has been organised to raise money to repair the gym damaged in Growing Pains. At school, Tabitha meets Avalanche who tells her that she would fit in at the Brotherhood but she declines his offer and then, she bumps into her father who asks her to help him get their family back on their feet again. She walks off but, Mr. Smith doesn't give up and turns up at the Institute later and convinces Tabby to help him steal the proceeds from the Carnival to help her mother. Later that night she manages to persuade Nightcrawler to come to the Carnival with her where they cause all sorts of mischief together before Tabby has to go and help her father steal the money. Kurt notices her leave with him and goes to find Scott who is also at the Carnival so that they can assemble the members of the team there and see what is going on. Avalanche and Blob also notice what Tabitha and her father are doing and when they have stolen the money from the safe, Toad steals it from them. The result is a big fight between Tabitha and her dad, the X-Men and the Brotherhood for the money. Eventually, the police arrive and catch Mr. Smith with the cash and arrests him. Tabby is ashamed of what she has done and leaves the Institute, only to turn up at the Brotherhood house, blowing open Mystique's door and claiming the room as her own . . .
Fun and Games - starring Arcade and most of the X-Men. Anyway, Arcade finds the Danger Room controls and thinks that it is a big computer game. He manages to program Defcon 4 and the Institute gets ready to defend itself; this, of course, attracts the attention of the X-Men who all rush to the Danger Room to see what's going on. Arcade attempts to kill them, thinking it is a game, and meanwhile Scott and Jean have battled their way back into the mansion. Together, they all eventually stop Arcade after he is absorbed by Rogue and everything is hunky dory. . . Beast of Bayville - starring Spyke and Beast. Hank McCoy begins to act strangely in classes and eventually losses control of the beast within him . . .
Adrift - starring Cyclops and Havok. Scott goes to visit his brother in Hawaii . . .
On Angel's Wings - starring Angel, Rogue and Cyclops. Anyway, its a nice happy ending with the girl Warren accidentally injured all better. Angel doesn't join the X-Men but he is happy and the episode finishes with cute shots of the X-Men all enjoying Christmas with their families. African Storm - starring Storm and Spyke. Storm is kidnapped and it is up to Evan to save her . . .
Joyride - starring Shadowcat, Avalanche, Iceman, Multiple Man, Jubilee and Cannonball. Walk on the Wild Side - Rogue, Magma, Jean, Shadowcat and Boom Boom. Coming Soon to an 'Episode' Page near you . .
Operation: Rebirth - starring Wolverine, Nightcrawler, Rogue and Captain America. Wolvie reminisces about old times . .
Mindbender - starring Jean and Mesmero. Jean is placed under the control of a mutant named Mesmero and begins to steal keys from various locations with the help of other mind controlled members of the X-Men . . Shadow Dance - starring Nightcrawler and Amanda. Forge makes a new gadget for Nightie to use when he is teleporting, so he will be able to go to places further away that he cannot see. It slows down his movement through the portal he uses to teleport and this means that for the first time, he sees the strange dinosaur-like demon things that live there. Oh, and Forge, Logan and the professor zapped away the monsters in the mean time with a similar gadget to what was used in Middleverse. Retreat - starring Beast, Shadowcat, Sunspot, Wolfsbane, Iceman and Spyke. The Hex Factor - starring Quicksilver, Magneto and the Scarlet Witch. I've not see this yet either . . . :( The stupid thing is that they have shown the whole second season, including the finale over here, except the Hex factor and Walk on the Wild Side and now, they are going back to repeats of episodes like Growing Pains!!! How dumb is that?! Day of Reckoning (parts one and two) - starring everyone! Okay, I can't summarise these episodes in a line or two . . . the whole guide will be up soon! Season three already!! Help!! I can't keep up . . . .
Day of Recovery - starring ?? They haven't started showing this season over here yet. And besides, I need to do all the other guides first! Pity me! . . . .